The motorway is the longest in the UK and so I would guess if it was going to harbour ghosts it had plenty of places under which it could produce a creepy experience. A reported sighting that came in was a ghostly hitchhiking lady, this seems to relay well into many of the classic hitching ghostly folk around the area of Urban legends but again there’s nothing to say it couldn’t happen. If that isn’t enough to worry you pay attention on the long travel down the M6 as there has been a phantom lorry that was travelling along the wrong side of the carriageway. Even the toll section’s had a rather intriguing claim where ghostly sightings of Roman Troops have been seen. A lady, Sue Cowley, from Warwickshire filled in a survey about the sightings saying that she had witnessed upright shadows of man walking through the tarmac like it was water. Not surprisingly with a road that goes through so much of the country that a few spooks would find their way on to it. High Street and Suffield Road, Great Yarmouth. I’d say some sightings could be put down to sun exposure on the beach but this is England and I am realistic. Ghosts are more likely than heat mirages here! On both of these roads a phantom dog-like thing with long legs has been spotted running along at a fair speed only to end up with it disappearing into thin air. (sounds like my old greyhound). This twisted and windy road in Wales seems to have a Guardian Angel. A lady was driving home late one night and heard a voice to advise her to pull over. She pulled over in shock to the grass verge and then only a short space after a car came the wrong side of the road with no lights. Had she not have stopped she would have been in a serious accident. A more serene spotting on the ghostly roads of England appears to be one drivers report often too. Lock Bhuie has been reported to sport a Victorian Coach with very ornate detail driven by white horses. Apparently the coach is accompanied by bewigged footmen in the full period attire. Of course the whole carriage seems a little too flamboyant for one of the Victorian ghosts, shoe has been spotted riding a white horse along the road, then suddenly he’s appeared further down it far too quickly to have been natural. Okay it’s not ghosts or supernatural but sometimes human beings love to leave us things we could use for our own imagination. Driving along roads at night can be lonely enough however there is also a great sense of imagination when you pass a half completed road or perhaps even half over-grown ones. For instances in Portland, Oregan there is a section of unused ramp at the western terminus. How about heading on to Interstate 189 in Burlington Vermont, there are now lanes blacked by discarded electronics. Older areas might well have been left behind when an amendment to a highway/road has occurred and it’s not longer needed. A good example of this appears to be the Pennsylvania Turnpike where two-lane tunnels and four-lane approaches were bypassed. The old tunnels and roadways on this one were reused as a multi-use trail. There are also some where the road might have been a ramp up to a bridge that was demolished. Sometimes it’s due to the road never being finished, perhaps they started and ran out of cash or someone managed to put a stop to it. In London (England) the M11 motorway has two unused slips at Junction 4 (Charlie Brown’s) which would have gone into the link for the M12 motorway going to Essex. The A47 in Rutland, near Wardley has an unused stretch of carriageway that now only sees use as access to a transmitting station. The A2 in Kent ended up with part of the road being made into a public park then it was realigned back in 2009. 1000 Islands Parkway in Eastern Ontario, this is another interesting one as it has two Ghost Lanes down it’s 40km length, these lanes are now used pretty much as a pedestrian or cycle lane on a scenic area. Originally it was going to be an alternate route to the main inland highway and be a sort of divided highway. The plans were put in motion and began sometime in the 1930’s where the unnamed route was began, when the wartime shortages affected it part of the road was left as gravel and finished in 1945 when the war ended. Highway 25 was then added to the 1948 Ontario Maps. In 1952 the entire thing was then redesigned on another route by December 1952 as Highway 401 and the route was no longer in use. The Highway was due to become part of the freeway route but public outcry would be huge and so in the early 1960’s the plans were abandoned and the restoration on the river road but it’s fully decommissioned status as a road was eventually logged September 8th 1970, King’s Highway was to be no more. Whilst I have really skipped over many facts that could have been put up here really I just liked the story of the scenic parkway that sits there now. So perhaps if you are out travelling and spot somewhere as a road to nowhere you might like to hit me with a reply about them. As a child my parents drove under this large hotel sign every time we went through Stamford. The sign is for the George Inn, that was one of the large coaching hubs when the North Road through was very busy. It put up guests in it’s 16th Century Rooms and passing along the gallows on the way into town served as a warning to Highwaymen but a welcome to the travellers. 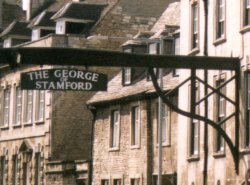 In 1852 a decision was made to route the railways through Peterborough and not Stamford, it killed a large volume of trade and left Stamford as a very pleasant place to visit. There are over 600 listed buildings there too. Not the band! or the kids show… But the Phenomenon. In World War II the pilotes of Allied aircraft described lights or strange things in the sky as foo fighter. Originally it was termed for the UFO sighting by the US 415th Night Figher Squadron but took on the name from there for all unexplained objects in the sky. The original assumption was that the lights or objects might be enemy craft, secret weapons etc but they were reported by both sides. The term foo was taken from Bill Holman’s Smokey Stover by Donald J Meiers from 415th Night Fighter Squadron. However a RAF Pilot’s report from a bombing mission over Germany in 1942 also contains the term so there is no confirmation about where it really began to be used. Pilots described objects that were glowing red, white or orange. Some said they came across the sky like Christmas lights and that they circled around like they toyed with the aircraft before they vanished. The other common factor is that they seemingly flew with intelligence but never seemed to act in a hostile manner. They were also known as “kraut fireballs” and the military did seem to take them seriously, strangely enough both German and Japanese pilots were reporting a similar thing. A rationale for the sightings was a possibility of afterimages from flak bursts, or perhaps St Elmo’s fire. On one occasion a gunner of a B-29 hit one and it was said that it fell in large pieces setting buildings on fire. Again people still unable to confirm this report state that they feel it is still more likely to be an electrostatic phenomena like St Elmo’s fire. So what is St Elmo’s fire? It’s a weather blip if you like, named after St. Erasmus of Formiae who is the patron saint of sailors. It is bright blue or violet and has at times been confused with ball lightning. The fire is a mix of gas and plasma, and they are often witnessed during thunderstorms as the right conditions are met to ignite them. Various legends for the beautiful natural event and some have been named. Welsh Mariners called them Spirit Candles, and the Chinese Goddess Mazu is believed to create a fire on top of a ships mast to bless lost sailors. St Elmo’s fire was also reported to have been seen in 1453, at the Seige of Constantiniple by the Ottoman Empire. It was reported to be on the top of the Hippodrome and the Byzantines said it was a sign that the Christian God would come to destroy the Muslim army. It then disappeared just days before Constantinople fell and ended the Byzantine Empire. A map of the gas attacks. Or the Anaesthetic Prowler/Mad Gasser of Roanoke as just a few names for example was given the title when the person/people performed a series of apparent gas attacks in Botetourt County, Virginia during the 1930’s. It was also a re occurrence for Mattoon in Illinois during the mid-40’s. Whether the cases are just mass hysteria or not an explanation for the events remain under debate. The reports ran between December 22, 1933 to February 1934. The first people to report the gas attacks were Mr and Mrs Bert Kearney, 1408 Marshall Avenue and they said he was a tall, thin man with dark clothes and a tight fitting cap. Another report some weeks later described the gasser as being female dressed up as male. The gasser was said to carry a flit gun (pesticide tool). The first report was in Haymakertown, Boutourt County, she reported an unusual odour at about 10pmn on 22nd Dec 1933 that made her feel sick, it returned again about half an hour later and they contacted the police. A third attack on the house happened around 1am and the whole house was affected with 8 occupants inside from the family and a guest. The symptoms they had included headaches, nausea, facial swelling, constriction of the mouth and throat. Alice Huffman (daughter of Cal) stopped breathing and had to be resuscitated. She had several fits afterwards which the doctor attributed to be anxiety attacks, not the affects of the gas. 24th Dec, Cloverdale had a report from the Hall family that after they returned from church and detected a small that made them feel sick and weak. The police found a nail had been pulled from the rear window and that this may well have been where the gas had been injected into the property. Dec 27th mother and son reported a similar event to thee Huffman and Hall cases. Then a fourth happened Jan 10th and then a second attack that night in Troutville. It is worth noting that several more were reported but police dismissed them as either hoaxes or possibly the effects of anxiety/hysteria. The second spate was in Mattoon, Illinois and began late August 1944. Raef woke up to find that he was weak and sick, he suffered a fit of vomiting and then went to his wife who he found partially paralysed and unable to leave her bed. A similar report was made by a young mother. September 1st there was a third report, she thought the smell was due to the flowers at first but changed her mind when she found that she was loosing feeling in her legs. There was no evidence of a prowler. Then her husband reported that he found someone snooping around but could not catch him, he gave a similar description to the original attacks of a tall man in dark clothes with a tight fitting cap. A cloth was found at a victim’s home and was tested but nothing was found during testing. More reports were coming in and it caused an investigation that included the FBI. The local police also had to stop the locals from forming groups that were on patrol and fear was being raised that someone might discharge a firearm incorrectly and cause more problems. During this time there were more reports from footprints to tears in window screens, all of which appeared to be adding to the hype. By September the police had so many reports that they had to act, they made a statement that the incident was likely a result of public fear and women’s anxiety over the local men on war service. Interestingly enough it did decline after this. Chief of Police C E Cole determined that there had been no gas attacks, the town had been sick with hysteria not gassing. There was, he felt, more likely an explanation in that the gas may well have been something carried over on the wind from the local industrial factory and that public panic had been more of the problem. In fact many of the symptoms such as nausea and choking, or even temporary paralysis are signs of shock/stress and other psychosomatic ailments. There was another fear that it was due to Toxic Waste or pollution, it was possible that it was a release of something called Carbon Tetrachloride however the primary company involved in this allegation was Atlas-Imperial and they were adamant that they could not have carried enough of that in the factory to cause such widespread symptoms over the two areas. Also before the time of the gassing they had been certified safe by the State Department of Health. Some researchers conclude that there is evidence there may have been some attacks by an actual assailant. It’s not clear if Botetourt and Mattoon are connected or that one is a copycat but the two ere nearly a decade apart and only affected the local area. 2003 saw a book by Scott Maruna, a former resident of Mattoon who feels that the attacks were due to a mentally disturbed man call Farley Llewellyn who was a chemistry student isolated from the community as he was believed to be homosexual. This was his notice and says that many of the attacks were within his local area. It was also claimed that the female gasser descriptions (more rare) were the work of his sisters to stop suspicion falling on him.